"I hate gym!" Probably for as long as schools have had physical education classes, kids have complained about them: "Gym class is boring/sweaty/scary/embarrassing!" Does your child feel this way? Try to change his tune; gym classes can be an important way for children to meet their daily needs for physical activity. In many cases, kids—especially teens and tweens—get most of their daily exercise at school. So if they're hanging back during PE time, they're missing out on an important opportunity to improve their health and fitness. If your child claims to hate gym class, try these steps to help adjust his attitude. If you start by saying "Well, even if you hate gym, you have to go," you've already lost your audience, says Tamar Chansky, Ph.D., a clinical child psychologist in Philadelphia and the author of Freeing Your Child from Negative Thinking: Powerful, Practical Strategies to Build a Lifetime of Resilience, Flexibility and Happiness. A better approach, says Dr. Chansky, is to start with phrases like "I hear you, it's not your thing" or "I don't think you're the only one feels that way." Your child already knows that he has to go to PE class. He wants to feel heard when she tells you she doesn't like it. Try to find out what is behind your child's declaration of disgust. What, specifically, bothers her about PE class? Dr. Chansky suggests asking, "What's the worst thing for you about gym class?" Your child might answer that she never gets picked for teams, or that everyone else is better at sports than she is. Or she might feel she doesn't have enough time to change clothes afterward, or she's uncomfortable changing in front of other kids. Don't guess or assume—you might be wrong. And consider, also, whether there are any physical or health issues that underlie your child's feelings. A child with poor depth perception, for example, might have a very difficult time coordinating her movements in class. The goal here is to have your child come up with his own solutions. Ask leading questions, like "Is improving your performance in PE important? How do you think you'd do that?" Be ready to offer suggestions, but try framing them as questions: "So you want to try shooting baskets on the weekends—would you like me or Dad to play with you? Or maybe Alex, or Donny?" If the locker room is a bigger problem than the class itself, brainstorm ways to overcome the awkwardness. Maybe your child needs a sports bra she can wear under her school clothes, or a stick of deodorant to keep at school. Maybe she can change in a bathroom stall if she gets good at doing it quickly. "Hate" is a strong word and provokes strong responses from parents (that's why kids use it!). "When a child says they hate something, we see a huge mountain in front of us," says Dr. Chansky. "We don't see how we will convince them to climb up that mountain. It helps if we can see our job as walking with them, instead." And just maybe, your child will walk into her next gym class without dragging her feet. Plus, school gym class is getting better all the time. 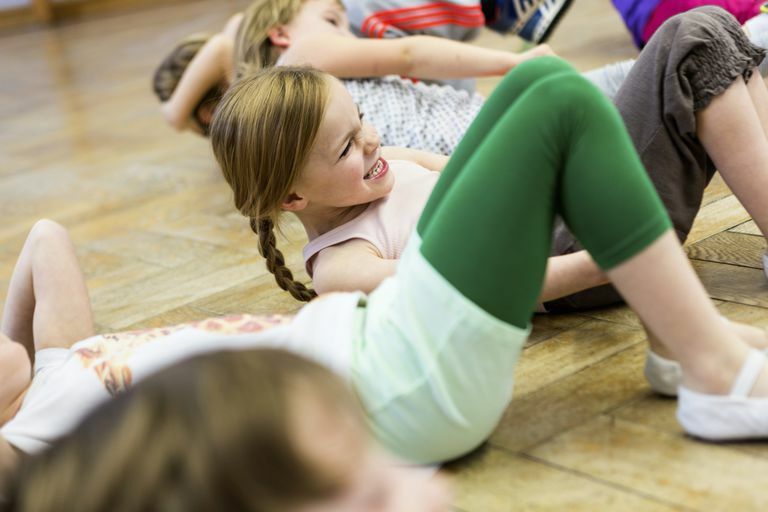 The goal is shifting toward helping kids enjoy lifelong fitness and health, so teachers really want their students to find forms of exercise that they like. At parent-teacher conference time, talk to the PE teacher about sports and activities your child has enjoyed in class, and outside of it. You might be able to improve the gym class experience for everyone. Carlson JA, Schipperijn J, et al. Locations of Physical Activity as Assessed by GPS in Young Adolescents. Pediatrics, Vol 136, No 7, January 2016. How Should You React When Your Child Makes a Mistake?